is one hour helicopter flight from Pokhara to Annapurna Base Camp. It takes about 3 hours to complete the Annapurna helicopter tour from Kathmandu. Annapurna Base Camp Helicopter landing tour is second most popular helicopter tour in Nepal. Mt. Annapurna (8091m) is the 10th highest mountain in the world. Exploring the base camp of Mount Annapurna and Dhaulagiri is the major highlights of this heli ride package. This Annapurna helicopter flight takes you over the hills, villages, jungles, rivers and lands at the mountain base camp. For those who are limited by time but want to explore the Himalayan beauty, this Annapurna Base Camp Helicopter tour is the best option. Heli tour to Annapurna gives you the opportunity to view many dramatic landscapes, lush and primitive valleys and stunning mountain ranges of the entire Annapurna region. 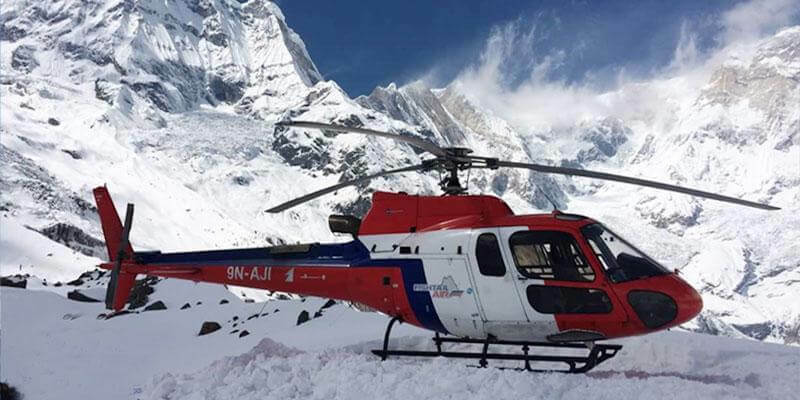 In fact, the helicopter tour constitutes the fastest possible and an excellent way to get close views of various mountains belonging to the Annapurna region and get a wonderful experience of the behold wilderness. Flying from the Pokhara airport, the helicopter flight directs towards the north and offers the stunning view of mountains like Mount Annapurna, Mount Nilgiri, Mount Machhapuchhre, Mount Dhaulagiri, Mount Manaslu and Mount Hiunchuli, along with many neighboring mountain peaks. Similar to Everest Base Camp Helicopter tour, this heli ride is best for mountain views of Annapurna and Dhaulagiri range. For the Annapurna Helicopter tour, you can fly all year around in day time but the visibility should be clear. So autumn and spring are the best seasons to explore the Annapurna by helicopter. Winter (December to February) is perfect but the landing place will be full of snow. Rainy season is not recommended for the helicopter ride because the cloud and foggy weather disturbs on the visibility and almost not possible to fly. So best time for Annapurna Base Camp Helicopter tour is in the months of February, March, April and May. September, October, November and December are the other months for helicopter flight. ABC helicopter can be possible by two ways: Charter basis private helicopter tour and group joining helicopter tour. In private charter flight you can fly with your group or single on your own time and schedule. It can be possible to arrange from Kathmandu and Pokhara also. If the weather is favorable, the flight is possible to operate anytime in the day. If we have group joining flight available then we will offer you the best price and package. Offers views of the Fewa Lake, Pokhara Valley and constant view of the massif Annapurna, Machhapuchhre, Dhaulagiri and other mountain ranges constitute the prime highlights of the entire trip. The helicopter tour price is different for different options. Private Charter flight costs about USD 1800 from Pokhara and USD 3500 from Kathmandu. Group joining helicopter cost USD 400 per person. The cost on the group joining is share with the total number of persons flying together. To book your place in our group joining and private charter flight, contact us via phone or email. You can make inquiry before your trip. We need you passport copy and the flight cost. Flying like a bird and explore the views of Himalayan peaks close to your eyes is the dream of many people. So, grab the opportunity of flying to the Himalayas now – Call us at: +977 9818392976. We have contact in a very last minute on our part, but Nepal Helicopters team were very quick to respond and arranged everything for our requests. Everything was simple and efficient. My one "must do" in Nepal was to be at the base camp of Mount Annapurna. Didn’t have enough time to do the trek and the flight around the Himalayas seemed lame. We found the Annapurna Base Camp by helicopter as an option and we jumped at the opportunity. It was really a wonderful moment of my life. For anyone who wants a lifetime story to share, Do This!! You won’t regret it.